The Harlequin Duck, Histrionicus histrionicus, favors extremely turbulent water. It breeds in Northern Canada but is a regular winter resident along both coasts in the US. 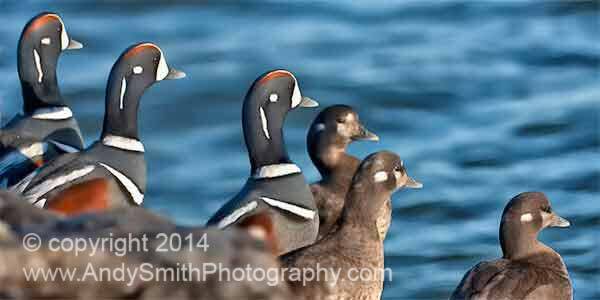 This group is on the jetty that extends from the Barnegat Lighthouse in New Jersey, where a group of around 30 winters every year. Harlequins are very communal and tend to be found in groups along the jetty.